Have you heard about this yet? Maple water. Because apparently coconut water is so last year! Maple water may soon be the new kid in town. I welcome the new addition to the plant-based-water market. Personally I can’t stand coconut water. I want to like it, but the flavor is just a little too funky for my palate. Drinking maple sap isn’t new, ancient cultures have been drinking this stuff for a long time, promoting it’s many health benefits. It’s filled with electrolytes and is great for hydration. It’s high in manganese, and a good source of calcium and iron. The taste (so I’m told) is just slightly sweet and has very little sugar and is low in calories. 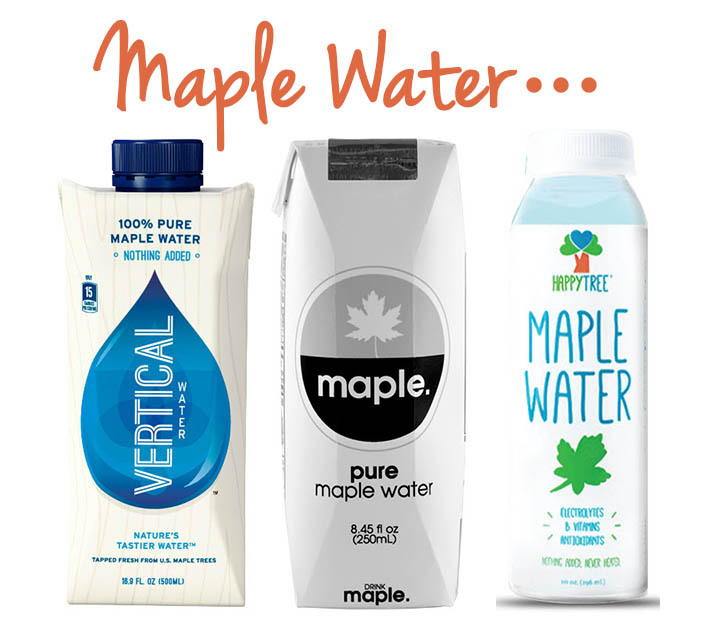 These are the 3 brands I’ve seen penetrate the US market: Vertical Water, Drink Maple and Happy Tree. It’s only a matter of time until we see this trend pop up in recipes and beverages everywhere. Maple water popsicles, cocktails and smoothies….oh my! Have you tried maple water? What do you think? I am not a coconut water person either. Maple water sounds delicious. We had Maple flavored coffee in New Hampshire, and it was wonderful!